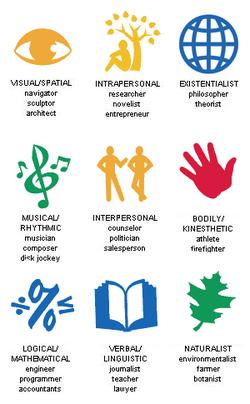 In 1983 Howard Gardner, a psychologist and professor, developed a theory of multiple intelligences from which every individual pulls from to make up their own individual self. He proposes that each of these intelligences can be enhanced with practice regardless of age, but "intelligences" are generally set by the time a child reaches adolescences (Sadowski, 2008). Gardner's multiple intelligences should not be confused with an individual's learning styles, though it seems as though Gardner as taken the three basic learning styles and expanded upon them. Below are lists of both for one to differentiate between the two theories. Visual- learning by seeing and looking- executive positions where a vision of the future is important, architects, engineers, and surgeons. Kinesthetic- learn by touching and doing- dancing, acting, construction, or athletics. As educators of adolescents we have to work with the hand that is dealt us. We have to be open to the multiple intelligences of our students. We should aim to teach to each of these intelligences equally. This does not mean that we have to teach to each intelligence in every single lesson, but rather implement as many ways of learning as possible so that we reach as many students as we can in any given lesson. Figuring out a variety of ways to present a lesson also helps us, as teachers, to better understand the content that we are delivering to our students (Sadowski, 2008). We develop a deeper understanding as we look to explain materials in a variety of ways in our lessons. We are supposed to be experts in our fields of instruction so that we can effectively pass on knowledge to a younger generation, and what better way to become an expert than to explore as many facets of the content we plan to deliver as we possibly can. Howard Gardner touches on his theory of multiple intelligences and explains the importance of shifting from a teacher-centered education to one where the students are at the center of learning. In this type of classroom students are able to learn the same content, but through different modes of learning. This type of differentiation is a way of teaching to the multiple intelligences of our students. Gardner, H. (1999). Intelligence reframed. NY, New York: Basic books. Sadowski, M. (2008). Adolescents at school. Harvard education press: Cambridge, MA.